In 1938, former Sierra Leone missionaries George and Daisy Fleming visited UB churches on the West Coast. In Dayton, Wash., they met Mrs. Mary Wilson. In 1866, when she was 14 months old, Mary was left in the care of her grandmother in Indiana while her parents, Oliver and Mahala Hadley, left for Sierra Leone. Mary hardly knew her father, because he died just a few days after returning from Africa. Nor did she know her sister Ida, who died in Sierra Leone six weeks after being born, or her infant brother, who died ten days after her father. But she had her father’s journal, written in longhand. She presented it to George Fleming because she thought the Missions department should have it. The journal entry for May 31, 1867, included a message for Mary. It was her second birthday. I feel happy this morning that the Lord ever gave [Mary Elizabeth] to us. Oh that we could have her with us. I think of her more than usual since little Ida’s departure. My dear child Mary, we will roast a fowl and celebrate your birthday, though we are far away in a strange land. We may never see you again, but I hope you may read these lines if you live and know that I love you, my dear child, with a peculiar love. The Lord be merciful to you, my dear child. I have prayed that I may live with you in the everlasting Kingdom of Christ. I leave you in His hands. Mary passed away February 5, 1942, in Dayton, Wash.
You can read more about the Hadleys here. Bishop Todd Fetters will lead an Online Regional Review meeting to discuss the upcoming US National Conference and review items of business which will come before the conference. This is especially designed for ministers and lay delegates who were unable to attend one of the regional meetings held during May in Michigan, Ohio, and Pennsylvania. Time: 4:00 pm – 5:15 pm. The meeting will cover the same ground that the three geographic meetings covered during May. Dr. Luke Fetters and Mark Vincenti will present the proposals from the Human Sexuality Task Force. Rocky Spear will present the report of the Nominating Committee. The online meeting is open to the first 100 registrants. You can register here. You will want to read or download the reports from the Human Sexuality Task Force and the Nominating Committee. They are available here. For the meeting, you will need to submit questions ahead of time by email. Send your questions to Administrative Assistant Cathy Reich at: cathy@ub.org. You can join the meeting from your computer, tablet or smartphone. Start by going here. You can also dial in using your phone and just listen to the audio. Tim Scroggs (right), pastor 2003-2016 of Eagle Quest UB church (Columbia City, Ind. ), has been battling cancer for some time. He will undergo surgery on Wednesday, May 31. Here is an update from Tim. “First I want to thank everyone for their prayers and support. I recently completed chemo and radiation. It served its purpose in that the tumor has shrunk and the cancer has not spread to other organs. “The next step is surgery this coming Wednesday. They will be removing the tumor and surrounding cancer. Our prayer is that all the cancer cells are removed and I am able to receive full healing. 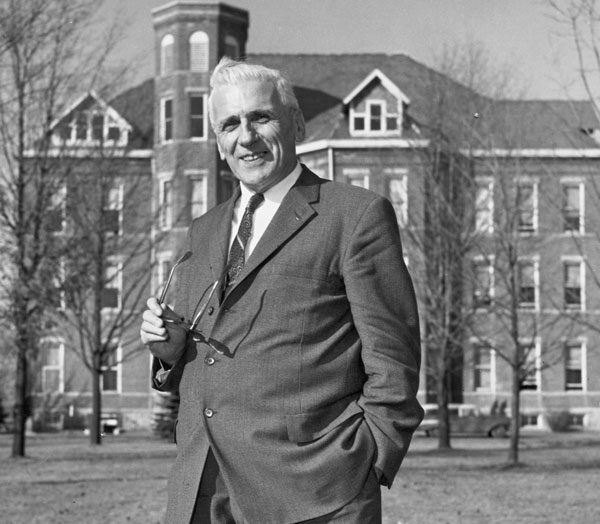 Dr. Elmer Becker in front of the Huntington University Administration Building, which is now called Becker Hall. During its first 40 years, Huntington College went through nine different presidents. Make that eight: Clarence Mummart held the position twice–once before he was bishop, and once after. Elmer Becker was born May 30, 1899, on a farm near Ayr, Ontario. He became a Christian at age 17 and felt called to the ministry. He completed his high school diploma in the Huntington Academy in 1920, and graduated from the college in 1924. In 1923, he married Inez Schad, a fellow member of the debate team who, at the time, was reportedly the only female member of a college debate team in Indiana. Becker was licensed to preach in 1924 and pastored churches in Ontario Conference for 13 years. The 1937 General Conference elected him as the denominational Secretary of Christian Education. Four years later, he became president of Huntington College. Becker’s 24-year tenure saw the addition of the Loew Alumni Library, the J. L. Brenn Hall of Science, and the Wright Hall men’s dorm, plus the expansion of the Livingston Hall dorm for women. Before long, the entire campus was celebrating. They even rang the college bell at 10:00 a.m. President Becker was out of town, but upon returning found the faculty and staff having a picnic on his lawn. With accreditation, HC was positioned to attract more donors and students, plus better faculty. Elmer Becker retired from the presidency in 1965 and passed away four years later. Martin Boehm and William Otterbein were elected bishops in 1800, when the denomination officially organized. The understanding was that these were four-year terms, which meant they would hold a new election in 1804. However, only five people showed up for the 1804 meeting. There was some kind of epidemic going on, probably yellow fever or cholera. Boehm was there, but not Otterbein. So the election was put off until 1805. Thus, Boehm and Otterbein started out serving five-year terms. The 1805 conference began on May 29, 1805. Both Boehm, 80, and Otterbein, 79, were among the 21 ministers who attended, and they were re-elected as bishops. That was the last conference Otterbein attended, though he continued as bishop until 1813. Boehm attended most years up through 1811, presiding alone. When neither bishop attended, Christian Newcomer and George Geeting presided. There doesn’t seem to be any record of Boehm and Otterbein being re-elected in 1809. Nevertheless, we have traditionally held that Boehm and Otterbein served as bishops until their deaths in 1812 and 1813 respectively (both at age 87). William Davis was born in 1812 and grew up in southern Indiana, which was untamed frontier back then. Raised in a very religious home, Davis gave his life to Christ at age 16. He preached his first sermon one week after turning 17, and was given a circuit of churches. For a while, he traveled to his churches on foot. When that became too difficult, he hired himself out at $8 a month until he could buy a horse and saddle. On May 26, 1830, proudly sitting atop his new horse, William Davis headed south to Harrison County, on the Kentucky border, to attend the first session of the Indiana Annual Conference. He was received as a minister and was assigned to the Tanner’s Creek circuit. Two years later, when the Wabash Conference was organized, he was elected as the presiding elder (like a superintendent). Though Davis was only 22 years old, historian John Lawrence said Davis had “the prudence, the foresight, and firmness” of someone much older. In 1846, Davis reflected on his 16 years as an itinerant minister. “Stephen Lillibridge did more, perhaps, than any other man of his day to extend the cause in the Sandusky Conference,” wrote UB historian John Lawrence. Lillibridge started many new churches and won hundreds of people to Christ. Unfortunately, his ministry lasted just eight years. He died at age 28. Lillibridge was born in 1815 and, at age 18, became a United Brethren minister in the Black Swamp territory of northern Ohio. Lawrence said the Black Swamp was “a dreadful country for an itinerant minister,” a wilderness both physically and morally. Lillibridge was always poor–he received less than $100 during his eight years of ministry–and lacked suitable winter clothes, but he never complained. In 1843, Lillibridge appeared at Sandusky annual conference in feeble health, yet he accepted a new circuit. Four weeks later, on May 25, 1843, he died, leaving behind a young wife. On May 25, 1839, Bishop Andrew Zeller, 84, passed away at his home near Germantown, Ohio. At the time, the Miami Conference, which consisted mostly of churches in Ohio, was holding its annual meeting in Germantown, near Dayton. It seemed clear that death was approaching. One visitor asked Zeller if he thought his last hour had come. Andrew Zeller was born in eastern Pennsylvania in 1755, and was married in 1779; he and Catherine would have nine children. Catherine died in 1822, but he remarried five years later. We don’t know much about Zeller. He became a Christian in 1790 and, at some point, entered the ministry. 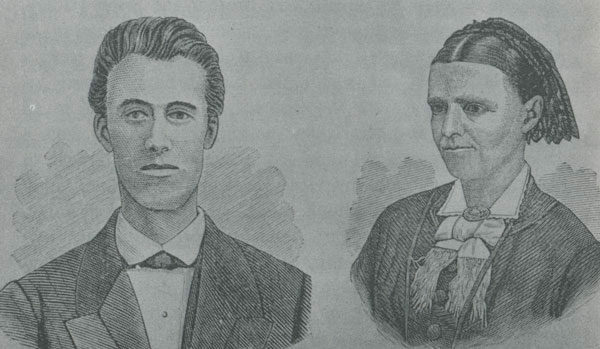 Traveling preachers often stopped at his home; Christian Newcomer’s journal makes a number of references to staying at the Zeller home and holding services there. Around 1806, Zeller bought several hundred acres for a farm in what was then considered the “far west”–Germantown, Ohio. He started a United Brethren church on his farm–the first UB church west of the Alleghenies. 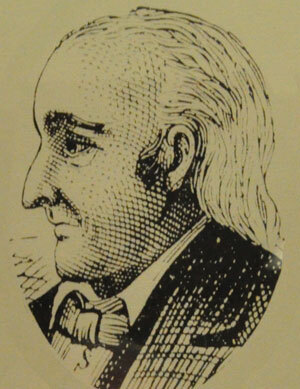 In 1810, Christian Newcomer came to organize the Miami Conference (named after the Miami Valley of western Ohio). It was only the second United Brethren conference to form. Zeller was listed among the ministers. When did Zeller become a bishop? Some UB historians say he was elected bishop at the 1815 General Conference, which Zeller attended. Others say it was 1817. It seems strange that General Conference would have left Christian Newcomer to serve as the only bishop until 1817, since we’d always had two bishops. However, at the time of the 1815 General Conference, Zeller wasn’t even an ordained minister. Two weeks after the conference, when the Miami Annual Conference met, Bishop Newcomer ordained a minister named Christian Crum, and then assisted Crum in ordaining seven other ministers–one of whom was Andrew Zeller. It is also recorded that Zeller was “ordained” as a bishop in 1817. That’s a practice that didn’t last long. Joseph Hoffman was similarly ordained as a bishop in 1821, but we then discontinued the practice. It was decided that when you’re ordained to the ministry, you’re ordained for whatever form that ministry takes–whether as a circuit-riding preacher, superintendent, or bishop. A second ordination was meaningless and unnecessary. We may be a little biased but our 2017 Kids’ VBS Project is fun, informative, and will give your kids’ program a distinctly international flavor. Contact us if you’d like a copy. Every year, children in Vacation Bible School support a mission project of some kind. For 2017, Global Ministries has selected Project Compassion, which ministers to children in India who live with HIV/AIDS. Global Ministries is providing five short videos along with suggested foods, activities, and ideas for follow-up at home which can be used for VBS or summer Sunday school. Through these short daily videos and activities, your kids will learn and experience a taste of what daily life is like for these UB children on the other side of the world—whether by learning how to say say hello, or trying out lentils and rice. Our prayer is that our kids will deepen in their understanding of God’s global family as they have the opportunity to learn, pray, and give. If you are interested in receiving these materials, let us know at by sending an email to info@ubglobal.org or by calling toll-free (888) 622-3019. On May 24, 1988, missionary nurse Patti Stone arrived at the Harbour Hospital and Institute for Tropical Medicine in Rotterdam, the Netherlands. The UB Mission in Sierra Leone had chartered a specially-equipped medi-vac Lear Jet from Munich, Germany. Patti was comatose. She received the best possible care from specialists, but didn’t respond to any treatment. The next day, May 25, Patti passed away. She was 25 years old. Cause of death was determined to be Fulminant Hepatitis A, a disease which progresses very rapidly and is nearly always fatal in adults. On September 2, 1981, Bishop Clarence Kopp had a unique encounter at a restaurant in Huntington, Ind. He met a man he had nudged toward the Lord 20 years before, when he was pastoring Prescott Avenue UB church in Dayton, Ohio. Now that man was bringing his daughter, Patti Stone, to Huntington College. 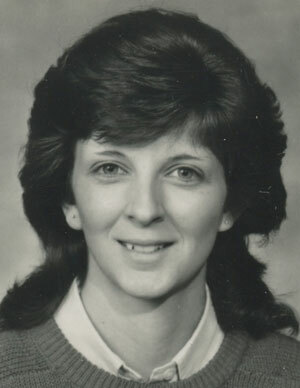 Patti completed her nursing degree at Marion College, and in May 1987 arrived as a missionary at Mattru Hospital. One of her classmates at Marion College, Michelle Becker, was already serving at Mattru. “Patti was a go-getter, a fantastic nurse,” said Michelle. “If someone else couldn’t get an IV inserted, Patti often could. She was confident and courageous. She wasn’t afraid to try new procedures. When anything exciting was happening, Patti wanted to be present. When a job needed to be done, Patti was there to help. Patti served a year at Mattru Hospital. Then, during the week of May 15, 1988, she fell ill and began showing symptoms of hepatitis. Dr. Ron Baker called Bishop Jerry Datema on Sunday, May 22, strongly urging that Patti be evacuated. But her condition kept deteriorating. On Monday morning, she slipped into a coma. On Monday, Dr. Dan Metzger flew with Patti to Freetown aboard the Sierra Leone president’s private helicopter. A specially equipped medi-vac Lear Jet, chartered from Germany, arrived at 4:05 Tuesday morning, and left a little over an hour later with Patti and Anne Spores, wife of UB Business Manager Darrel Spores. All was done that could have been done. But Patti never emerged from the coma. Jane Baker, wife of Dr. Ron Baker, wrote a moving tribute to Patti Stone about her year in Sierra Leone. “There’s a big gap at the hospital with you gone. You were an excellent nurse, conscientious and compassionate. You were hard working, known for going the extra mile….We miss the sound of your laughter drifting here and there. We miss seeing you buzz around on your Honda 100, helmet on, in a hurry to go down to the local market, or to a Mende lesson…. Jane also wrote about Patti’s special relationship with her adopted village, Karleh, where she spent a great deal of time. She loved village life, and the village people loved her. “You loved the Africans, and they knew it. You respected them. You had an insatiable eagerness to learn about them and their culture. You didn’t ask missionaries about cultural things…you asked the Africans. No wonder you learned so much in your short time in Sierra Leone….